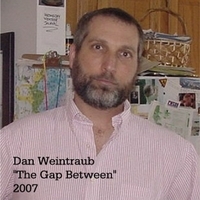 “I may be old/I may be fat,” sings Dan Weintraub, and with those hilariously revealing lines he has totally won us over. Far too many of today’s acoustic-pop artists are so focused on whoring themselves to suburban housewives and teenage girls that they’ve forgotten the folk roots of the genre. (Sadly, it has happened to country music as well.) This is lyrically driven style, and the words should not be nonsense. Weintraub writes candidly; you almost feel that you’re trespassing into the forbidden territory of someone’s mind. On “When I Was,” Weintraub cleverly observes how people often view the past with rose-colored glasses, letting sentimentality and nostalgia disguise the biting reality of truth. So “When I Was” isn’t about what Weintraub used to be; it’s merely his original perception of himself. The Lou Reed-esque “Too Many Lindas” jumps to the shuffling riffs of the Violent Femmes’ “Kiss Off” while “Just Before You” aches with the morose introspection of American Music Club and Buffalo Tom. This is quiet music with loud emotions. Don’t let the softness trick you. There is turbulence beneath the cozy embrace of Weintraub’s acoustic riffs.